So you may have seen me tweeting or writing on facebook about the #miosolochallenge that I'm taking part in this week and you're probably wondering what it's all about? Well as you may know (as I can be rather vocal about it!) 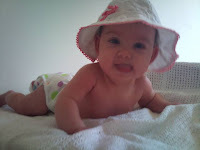 I use cloth nappies with my daughter Elizabeth and in the last 13 months I have become something of a cloth nappy addict! Although I considered using washable nappies when my son Ben was a baby, it was only when I was pregnant with my second child that I finally took the leap and invested in some cloth. As a 'penny pinching Mummy' of course one of the main factors in this decision was cost! Different sources vary in their findings but the general consensus is that from birth to potty training you will save between £500 and £700 by using washable nappies in place of disposables! (And yes that is taking into account all that extra washing powder and electricity to wash and dry them!) Another consideration was the environmental issues. It actually made me shudder to think that Ben was likely to have had around 5000 nappy changes before he was potty trained, resulting in around a tonne of household waste! As someone who sees themselves as being quite a 'green' parent I wanted to make sure I did not send even more unnecessary waste to landfill! The first washable nappies I purchased were Bambino Mio's two part nappy system, I got them for a really good price and I liked that I could buy the accessories in high street retailers such as Boots and Mothercare rather than having to order online or go to a specialist shop. Here's Elizabeth Modeling a Bambino mio nappy at 4 months old! As Elizabeth has grown, and as she has recently started at childcare my nappy needs have changed somewhat and I now tend to favour the pocket nappies or AIO's (all in ones) in my stash as these wash and dry so easily and are very simple to use. This means that It's a while since I have used a Bambino Mio nappy although I do still use the accessories such as the mioliners and the Miofresh as I found these to be both effective and reasonably priced. So I was delighted to hear that Bambino Mio were bringing out an AIO Birth to Potty nappy called the Miosolo! The Miosolo is now avaliable to purchase from their website and many other cloth nappy outlets for just £14.99, which is a very competative price for an AIO BTP nappy! You can imagine how excited I was when I was asked to take part in the #Miosolochallenge, where myself and nine other lovely Mummy Bloggers will be putting this brand new nappy through it's paces in a series of challenges over the next five days! 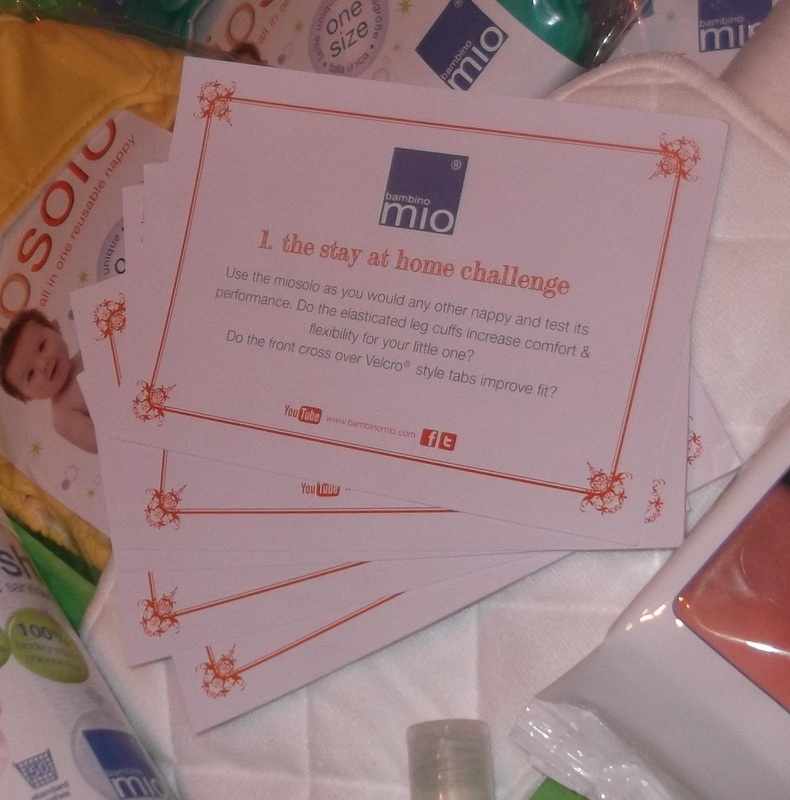 We were sent 3 miosolos in cola cube, peppermint cream and sherbet lemon as well as everything we needed to get started and of course the all important 5 challenges! The Solo's are now all prewashed and ready to go, so why not come back each day this week to see how we have put this new All In One nappy through it's paces! Check out the thoughts of myself and my fellow bloggers on the Bambinomio website or by searching for #miosolochallenge on Twitter. If you have a miosolo why not Join in? 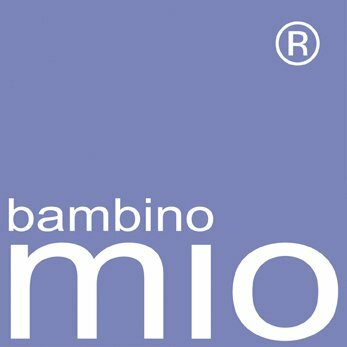 Can this new BTP AIO nappy from Bambino Mio really be as good as it sounds??? If you have any questions about the challenges or about switching to cloth nappies in general please get in touch on Twitter, facebook or leave me a comment below! 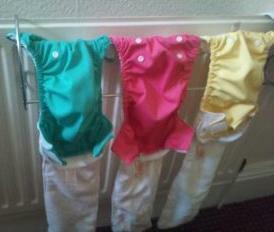 Im looking into using cloth nappies and have just purchased a trial pack fingers crossed i get on with them! !